I've been teaching myself the various settings in cameras and now have a much fuller understanding of how to use my camera effectively, but one thing is still bugging me. When the aperture size is changed, are any other lenses moving to refocus the ray bundles to the full frame size? What I mean is, to me, the aperture would seem like it would "crop" the image to a smaller and smaller circle (or n-sided shape, rather). While I understand that this obviously means less light, is there something else going on that refocuses the light bundle back to fit over the entire sensor when it is adjusted? 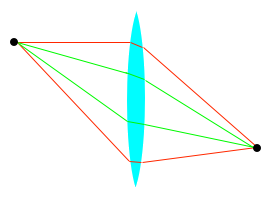 The green lines represent the cone of light striking the lens with a narrow aperture, the red is the cone of light allowed by a wide aperture. 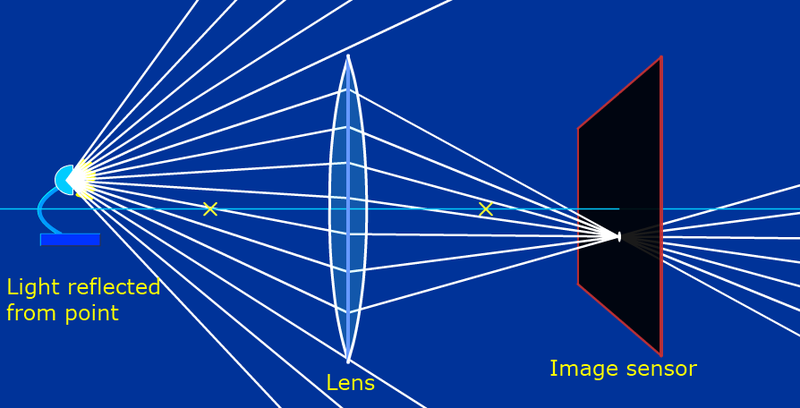 In this case you can imagine the aperture immediately in front or immediately behind the lens (there's not much difference with a simple lens) Regardless of the aperture, the light is still focused to the same point. That's a simple lens, but the same is true of complex ones. That's where your intuition about cropping (typically called vignetting in this context) the image comes into play: in a complex lens, the aperture has to be at an appropriate location. Obstructions in other parts of the lens will cause vignetting. The first thing to understand is that the light that reflects off any one point on a surface isn't one beam of light, but many, coming in at many different angles and reflected off at many different angles. Most of these beams will never hit the lens on the camera; however, some do, and will be focused onto a single point on the image-sensor (assuming that point is in focus). So what happens if we put an aperture behind (or in front of) the lens? Light from the point still hits the image-sensor, so it will still show up in the image. However, we now simply have less light from that point striking the sensor. This is why using a smaller aperture (or a smaller lens) requires longer exposure time; the sensor requires a longer amount of time to absorb the same amount of light. So, if making the aperture smaller forces you to use longer exposure times, what's the point of having an aperture at all? Reducing the exposed light can sometimes be useful (for example, that is the purpose of an eyeball's pupil, which is exactly analogous to an aperture), but the primary reason for having an aperture in a camera actually has to do with points that are out of focus. Notice that, in both cases, the light beams all come from a single point, but they don't all hit the image-sensor at a single point. Rather, they are spread out in a circle. This is what causes out-of-focus points to appear blurred in a photo. So, what happens when we put an aperture behind (or in front of) the lens in this case? We see once again that less light hits the sensor, meaning we'll again need a longer exposure. However, something else has happened: the circle of light (from our point) striking the sensor has become smaller. This will cause the point to appear more in-focus in the final image! Hence, a smaller aperture will increase the depth-range at which objects appear in focus, ie. it increases the depth of field. Thus, the larger the aperture (or lens), the less exposure time you'll need (due to there being more light), but the shallower your depth-of-field will be (due to the light from out-of-focus points striking a larger area). Inversely, the smaller your aperture (or lens), the larger your depth-of-field will be, but the more exposure time you'll need. If we could get an infinitesimally-small aperture†, we could get everything in focus in one shot... but we'd need an extremely long exposure time, or an extremely sensitive sensor! 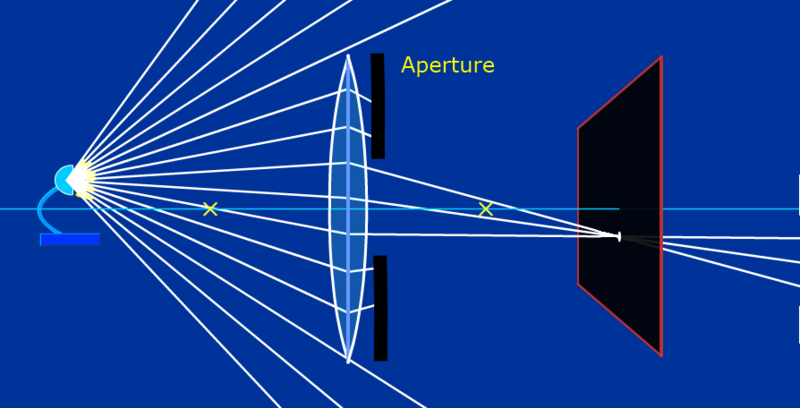 This is essentially how a pinhole camera works. I generated the above images using this awesome tool. It might help to think about your eye. Your eye is essentially a camera, and the iris in your eye works performs the same function as the iris in your camera's lens. When you walk outside on a bright day, your irises constrict to reduce the amount of light that hits your retina, but you still have the same field of view -- the image isn't cropped. The same thing obviously happens with your camera's lens. The reason that the image isn't cropped is that rays from the entire image fall on the entire surface of the lens (whether your camera or your eye). 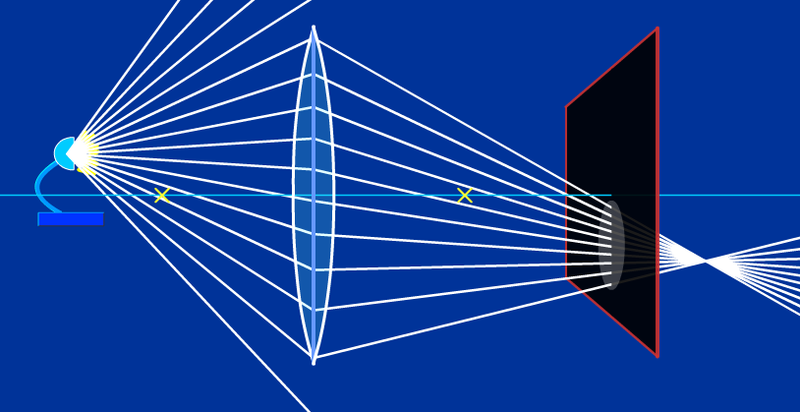 You can imagine a cone of rays leaving each point in the field of view, where the tip of the cone is at the point and the base of the cone is the lens. The iris reduces the diameter of the base of that cone, so there's less light, but part of the cone nevertheless passes through the iris and is focused by the lens to a single point on the sensor (or retina). 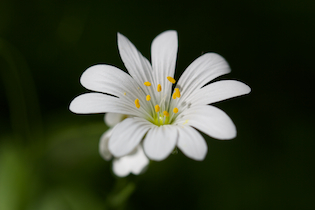 No, there is no refocusing needed when you change the aperture, and the aperture doesn't crop the image. As you might know, the image is mirrored and upside down when it hits the sensor. The image is focused into a single point inside the lens, and comes out flipped on the other side. This point where all light rays meet is the aperture, that's why the image can pass through such a small hole without being cropped. The lens elements in a lens is actually not needed to produce the image, only the aperture is needed. A pinhole camera doesn't have any lenses at all, it only has a small pinhole that works as aperture and projects the image onto the film. The effect is named camera obscura and is where the camera gets its name from. Not the answer you're looking for? Browse other questions tagged aperture optics or ask your own question. Why does higher aperture (less light) make an image sharper? Does a larger aperture automatically mean a bigger shot? How do wavefronts/wavelets propogate in three dimensions, and why is this important for photography?